1 A None No Power Seat 1 A is an Economy Class Bulkhead seat with some extra legroom due to the position of the bulkhead. The pitch for this seat is 39.2". The tray table is in the armrest, making the armrest immovable and slightly reducing the seat width. There is no floor storage for this seat during takeoff and landing. The close proximity to the galleys and lavatory may be bothersome. 1 B None No Power Seat 1 B is an Economy Class Bulkhead seat with some extra legroom due to the position of the bulkhead. The pitch for this seat is 39.2". The tray table is in the armrest, making the armrest immovable and slightly reducing the seat width. There is no floor storage for this seat during takeoff and landing. The close proximity to the galleys and lavatory may be bothersome. 1 C None No Power Seat 1 C is an Economy Class Bulkhead seat with some extra legroom due to the position of the bulkhead. The pitch for this seat is 39.2". The tray table is in the armrest, making the armrest immovable and slightly reducing the seat width. There is no floor storage for this seat during takeoff and landing. The close proximity to the galleys and lavatory may be bothersome. 1 D None No Power Seat 1 D is an Economy Class Bulkhead seat with some extra legroom due to the position of the bulkhead. The pitch for this seat is 39.2". The tray table is in the armrest, making the armrest immovable and slightly reducing the seat width. There is no floor storage for this seat during takeoff and landing. The close proximity to the galleys and lavatory may be bothersome. 1 E None No Power Seat 1 E is an Economy Class Bulkhead seat with some extra legroom due to the position of the bulkhead. The pitch for this seat is 39.2". The tray table is in the armrest, making the armrest immovable and slightly reducing the seat width. There is no floor storage for this seat during takeoff and landing. The close proximity to the galleys and lavatory may be bothersome. 1 F None No Power Seat 1 F is an Economy Class Bulkhead seat with some extra legroom due to the position of the bulkhead. The pitch for this seat is 39.2". The tray table is in the armrest, making the armrest immovable and slightly reducing the seat width. There is no floor storage for this seat during takeoff and landing. The close proximity to the galleys and lavatory may be bothersome. 10 A None No Power Seat 10 A is an Economy Class Exit Row seat with extra legroom that can fully recline. The pitch for this is 36.0". The tray table is in the armrest, making the armrest immovable and slightly reducing seat width. There is no floor storage for this seat during take-off and landing. 10 B None No Power Seat 10 B is an Economy Class Exit Row seat with extra legroom that can fully recline. The pitch for this is 36.0". The tray table is in the armrest, making the armrest immovable and slightly reducing seat width. There is no floor storage for this seat during take-off and landing. 10 C None No Power Seat 10 C is an Economy Class Exit Row seat with extra legroom that can fully recline. The pitch for this is 36.0". The tray table is in the armrest, making the armrest immovable and slightly reducing seat width. There is no floor storage for this seat during take-off and landing. 10 D None No Power Seat 10 D is an Economy Class Exit Row seat with extra legroom that can fully recline. The pitch for this is 36.0". The tray table is in the armrest, making the armrest immovable and slightly reducing seat width. There is no floor storage for this seat during take-off and landing. 10 E None No Power Seat 10 E is an Economy Class Exit Row seat with extra legroom that can fully recline. The pitch for this is 36.0". The tray table is in the armrest, making the armrest immovable and slightly reducing seat width. There is no floor storage for this seat during take-off and landing. 10 F None No Power Seat 10 F is an Economy Class Exit Row seat with extra legroom that can fully recline. The pitch for this is 36.0". The tray table is in the armrest, making the armrest immovable and slightly reducing seat width. There is no floor storage for this seat during take-off and landing. 11 A None No Power Seat 11 A is an Economy Class seat that may have some extra legroom. The pitch for this seat is 33.0". 11 B None No Power Seat 11 B is an Economy Class seat that may have some extra legroom. The pitch for this seat is 33.0". 11 C None No Power Seat 11 C is an Economy Class seat that may have some extra legroom. The pitch for this seat is 33.0". 11 D None No Power Seat 11 D is an Economy Class seat that may have some extra legroom. The pitch for this seat is 33.0". 11 E None No Power Seat 11 E is an Economy Class seat that may have some extra legroom. The pitch for this seat is 33.0". 11 F None No Power Seat 11 F is an Economy Class seat that may have some extra legroom. The pitch for this seat is 33.0". 24 D None No Power Seat 24 D is an Economy Class seat in the last row of the plane that has limited recline. The close proximity to the lavatory may be bothersome. 24 E None No Power Seat 24 E is an Economy Class seat in the last row of the plane that has limited recline. The close proximity to the lavatory may be bothersome. 24 F None No Power Seat 24 F is an Economy Class seat in the last row of the plane that has limited recline. The close proximity to the lavatory may be bothersome. 25 A None No Power Seat 25 A is an Economy Class seat in the last row of the plane that has limited recline and is missing a window. The close proximity to the lavatory may be bothersome. 25 B None No Power Seat 25 B is an Economy Class seat in the last row of the plane that has limited recline. The close proximity to the lavatory may be bothersome. 25 C None No Power Seat 25 C is an Economy Class seat in the last row of the plane that has limited recline. The close proximity to the lavatory may be bothersome. 9 A None No Power Seat 9 A is an Economy Class seat with limited or no recline due to the Exit Row behind. The pitch for this seat is 31.0". 9 B None No Power Seat 9 B is an Economy Class seat with limited or no recline due to the Exit Row behind. The pitch for this seat is 31.0". 9 C None No Power Seat 9 C is an Economy Class seat with limited or no recline due to the Exit Row behind. The pitch for this seat is 31.0". 9 D None No Power Seat 9 D is an Economy Class seat with limited or no recline due to the Exit Row behind. The pitch for this seat is 31.0". 9 E None No Power Seat 9 E is an Economy Class seat with limited or no recline due to the Exit Row behind. The pitch for this seat is 31.0". 9 F None No Power Seat 9 F is an Economy Class seat with limited or no recline due to the Exit Row behind. The pitch for this seat is 31.0". Shared screens on board the aircraft show movies and television shows which change each month. Video options are listed in Brussels Airlines' magazine, b.spirit. Complementary beverages and snacks are provided. This A319 aircraft carries 141 Economy Class passengers in a one-class configuration with 25 rows. This aircraft is used on a variety of routes throughout Europe and the Middle East. Holy smokes, this is probably the worst seat. No window and it is right where the fuselage constricts, it is VERY claustrophobic. On the positive, you can have the seat reclined through the whole flight. Scandalous ! I'm 6'6 and didn't managed to sit, that row of seats (19 D E F) is smaller than the rest of the plane. Hopefully one seat was available elsewhere and that left "some space" for my wife and teen to fly more or less comfy. The legroom for this seat is very comfortable. A disadvantage for this flight is that there is not enough room in the overhead compartments for all passengers to stow their carry-on baggage. Because this is a short flight and because Brussels Airlines charges for checked luggage, many passengers bring their belongings in cabin trolleys. It's a pity that the staff doesn't act upon this. In other airlines staff offer passengers to check their carry-on baggage right before boarding for free in such case. The service provided by Brussels Airlines resembles that of a low cost carrier already for a few years now. It's just not as cheap yet. Hopefully Lufthansa can soon turn the tide for Brussels Airlines' poor service. Exit row 10 with increased legroom not selectable at web check-in, only at the airport. 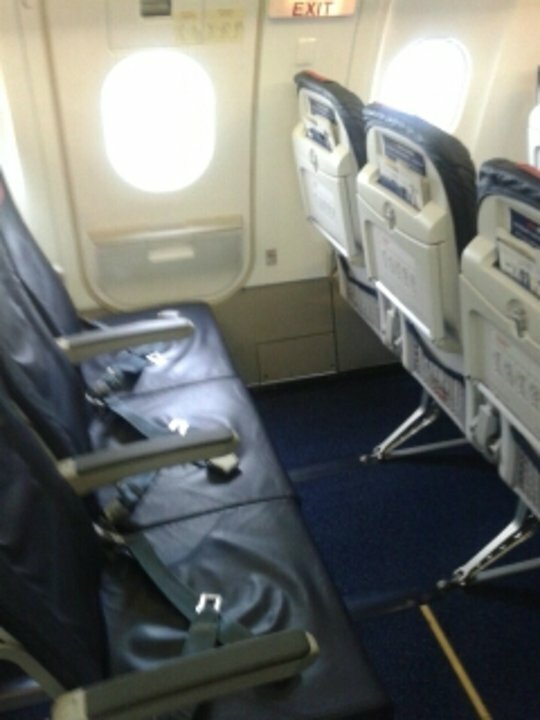 However row 11 has almost similar legroom and can be selected during on-line check-in! All other rows of B-Light and B-Flex have less legroom. Brussels Airlines flies 1 versions of Airbus A319.